Geoff Kabush has made a name for himself riding and winning bike races in various disciplines. The race machine he was on at the 2018 Canadian cyclocross championships reflected that diverse skillset. Kabush was aboard his Open U.P. all set-up for ‘cross but just a week prior he had raced and won Iceman Cometh abroad the very same bike. Does that make it an adventure bike? Perhaps it’s more of a wide clearance gravel or cyclocross bike? With the right wheels and tires it’s nearly a mountain bike. Equipped with 27.5 x 2.1″ tires, he took the first ever drop bar bike win at Iceman Cometh then turned around and rode to second behind Michael van den Ham at nationals on 700c wheels. The Open U.P. frame, which is carbon, was the bike that popularized interchangeable discipline wheels on a drop bar bike. While Kabush comes from a mountain bike background, he’s taken up a lot of mixed surface racing these past few years like Dirty Kanza while still frequently racing mountain bike and also some cyclocross here and there. At 41-years-old, he doesn’t appear to be slowing down or enjoying himself any less. 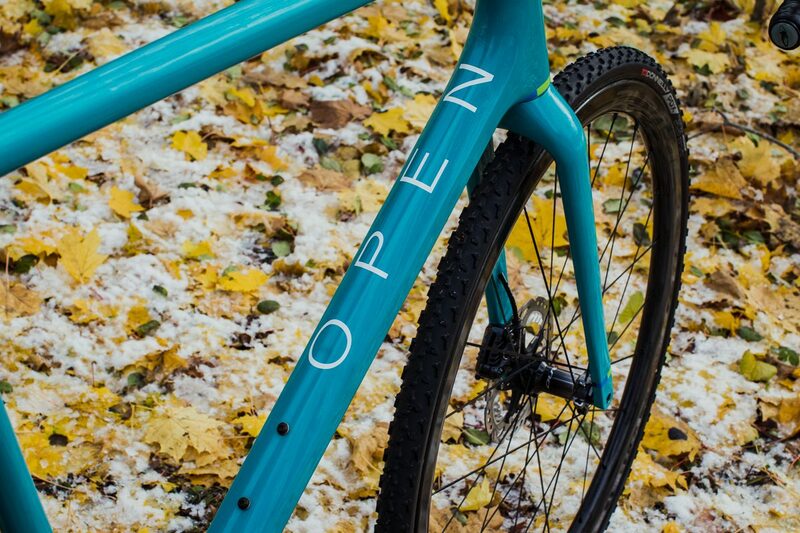 When Kabush rode a drop-bar bike to a win at Iceman Cometh, the equipment choice evoked that of Tomac, a rider who took a drop-bar Yeti C-26 on the trails in the early ‘90s. Kabush certainly sent it when he road the U.P. in a mountain bike race and he was one of the strongest technical riders on the muddy course in Peterborough. For Iceman, Kabush ran Stan’s No Tubes Valor 27.5″ mountain bike wheels but for nationals, he was on Shimano Dura-Ace tubulars. The whole build is Shimano’s top-end Dura-Ace Di2 electronic road groupset with hydraulic disc brakes. Kabush’s mechanics would have been busy setting his two Open’s up for ‘cross between Iceman and nationals. The wheels weren’t the only thing that needed to be swapped out. At Iceman, he raced 46/34 Dura-Ace chainrings while for cyclocross he opted for a 46/39 set-up. The bigger chainring would have been used sparingly but helped get off the line with speed and for the paved finishing straight. Kabush's PRO Vide cockpit. Photo: Matt Stetson. Kabush was riding strong reeling in a charging van den Ham in the finale of Saturday championship race. An untimely puncture hindered his progress and we crossed the line second but taking the podium for the eighth time in as many years. Not everything on the bike needed to be replaced for Saturday. Kabush race the same PRO Vide 100 mm stem and 44 mm wide bars for ‘cross as he did at Iceman. He also kept his PRO Turnix saddle and Shimano XTR mountain bike pedals. Watching Kabush over the weekend which was capped by a third-place finish in Sunday’s UCI race, you wouldn’t have known he wasn’t racing a dedicated cyclocross whip. Kabush’s season is just about over so the Open U.P. won’t be seeing another competition this year. If the latter of this season has been any indication, maybe we’ll keep see Kabush line-up at races abroad an unothodox curly bar bike.